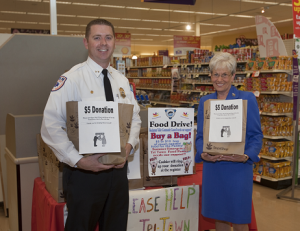 Read the Hartford Courant article on the Emergency of Hunger Food Drive…. Local emergency and public service agencies will be teaming up again this holiday season to collect food and cash to stock up depleted area food banks and shelters. Representing their respective towns, teams are made up of police, fire, public works and EMS professionals, employees of Eastern Connecticut Health Network (ECHN) and Rotary Club volunteers. Last year’s food drive turned into a heated but friendly competition to see which team could collect more turkeys for holiday baskets, and much needed food items and cash. Last year Vernon bested Manchester with impressive combined totals of 32,574 food items, 1735 turkeys and over $20,000 in cash and gift cards for needy families during the holidays. This year a team from South Windsorwill join in the competition. At all locations, flyers listing priority items will be handed out at the grocery store entrance and donations will be collected at the exits. To raise the stakes, the police chiefs have agreed to a new wager…A picture of the chief from the winning team will be prominently displayed in the lobby of the two other chief’s departments for the year. Hockanum Valley Community Council (HVCC), MACC Charities and South Windsor Food and Fuel Bank will be the beneficiaries. This entry was posted in ASM Company News, Community Relations Event, In the Hartford Courant, News/Press Release and tagged Ambulance Service of Manchester, ASM, ECHN, Food Drive, Hartford Courant, HVCC, MACC Charities, Manchester Police Department, Skoczulek, South Windsor, Stop and Shop, Vernon by ASM-Aetna. Bookmark the permalink.